Though hearing loss is the third most common medical condition in the US, it is often overlooked because it is invisible. That is to say, we do not notice – often for many years – the experience and the effects of untreated hearing loss. On average, people wait five to seven years between the time they first experience changes in their hearing to the time they decide to seek treatment. 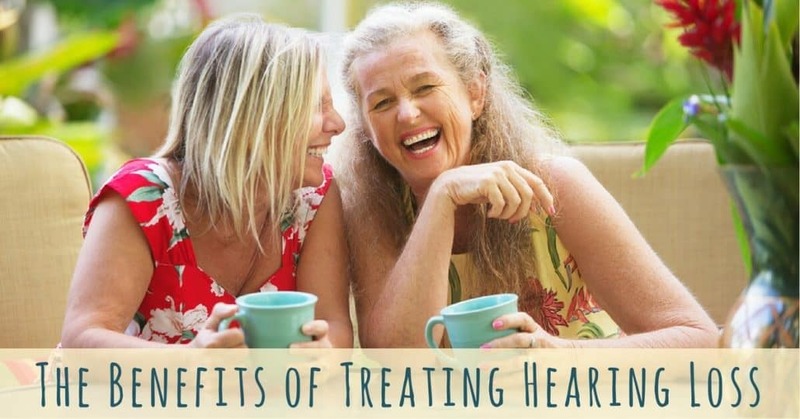 While there is no cure for hearing loss, countless studies have outlined the significant benefits of treating hearing loss with the use of hearing aids. When fitted properly to address your specific hearing needs, hearing aids restore hearing in ways that are truly beneficial to our health. Hearing aids support our brain function, reconnect us to our loved ones, and ensure our well-being. Leaving hearing loss untreated brings many negative consequences both your mental and physical health. People with untreated hearing loss are at higher risk to develop dementia, due to the cognitive load required of the brain to process muddled sound signals. They are at higher risk of having falls and accidents, as well as hospitalization. With untreated hearing loss, people are more likely to withdraw from their regular social engagements and interactions with friends and loved ones because speech recognition becomes difficult. As a result, people with untreated hearing loss are at higher risk of developing depression, as well as stress and anxiety conditions. In turn, lack of social engagement affects your cognitive abilities, which contributes to the risk for developing dementia. Fortunately, the use of hearing aids brings significant benefits for people who experience hearing loss. When we experience hearing loss, it actually happens in the brain. Our outer and middle ears conduct sound and the inner ear hair cells translate those sound waves into vibrations that are registered by the brain as sounds we recognize, from familiar voices to dogs barking to fire alarms. With hearing loss, these neural signals become muddled. With incomplete and unclear signals, our brains struggle to make sense of what we’re hearing. Depending on the type, configuration, and degree of your hearing loss, you will be fitted for devices that are tailored to meet your specific needs. Hearing aids have been designed to assist our auditory process and are equipped with microphones that pick up sounds from our environment, as well as algorithms to digitally clarify and organize these signals into sounds our brains will register clearly. Studies from Johns Hopkins University have found that test subjects with hearing loss who do not use hearing aids experience a heavier cognitive load. This burden on our cognitive functions may increase the risk of dementia. The good news: people who treat hearing loss with hearing aids were found to perform better on cognitive tests, with results on par to people with normal hearing. In other words, the use of hearing aids support brain function. For people who experience hearing loss, one major difficulty is speech recognition. We may find it difficult to anticipate speech patterns and identify the source of speech in a challenging noise environment. Additionally, hearing loss interferes with our inability to fully understand words, which is why it may sound like people are mumbling or not speaking clearly. Challenges with speech recognition are related to social withdrawal and isolation, commonly experienced by people with untreated hearing loss. With speech recognition features, hearing aids ensure that conversations, whether one-on-one or in a big group setting, are crisp and clear. Because good communication is the bedrock of strong relationships, the use of hearing aids keeps us connected to the relationships that matter most to us. For people with normal hearing, the sense of sound ensures safety and security. With the ability to locate sounds in our environment, our sense of hearing keeps us out of harm’s way. Studies have found that people with untreated hearing loss have an increased rate of falls and hospitalizations. Many hearing aids offer features that help you locate yourself within your environment, which then allows you to identify and focus on sounds that keep you grounded and safe. Furthermore, studies have found that people with untreated hearing loss tend to have lower earning power than colleagues with normal hearing or colleagues who treat hearing loss with hearing aids. Hearing aids ensure clear channels of communication on the job and the support they provide to your cognitive abilities ensures better concentration and productivity. It has been shown that people who treat hearing loss with hearing aids do not lose their earning power on the job. There’s no reason to live with untreated hearing loss! If you’ve been experiencing changes to your hearing, take the first step toward better hearing health by scheduling a hearing test at Bay Area Hearing Service.